At last we got a couple of days of spring weather. It didn't last long and it's raining today but I surely enjoyed every single bit of it. As you can see, I'm already transitioning from the dull outfits I wore most of winter to oh-so-loved neutrals and pastels. How beautiful! I love this outfit! Same here. We had just for a day or two good weather. That was all! Its now freezing. I love your outfit! Like usual. Especially the color combination. Isn't it great to get out of winter clothes! You do neutral best El! Really love neutrals as well!! I love it, it's such a refreshing look, especially those blissfully white jeans. I never liked white pants, but they look so great on you! Hope you're enjoying the lovely weather! 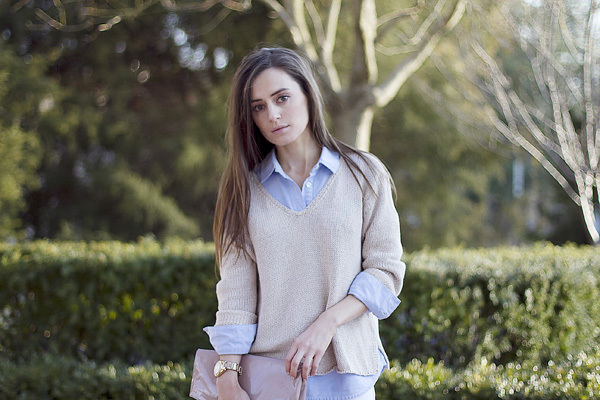 Love this super simple, classic look with light layering! Literally, you look like a mannequin straight out of a J.Crew window display. I love it. The styling is classic and clean. Gorgeous outfit, lovely colour palette! Thanks for the post! Потрясающий блог, один из лучших, что мне доходилось находить за последнее время!!! С удовольствием на вас подписываюсь!!!!! Gorgeous and classy outfit. I love pastel colors. I just discovered your blog and I love it! Do we follow? I love this look. Less is more!